COPPELL, Texas--(BUSINESS WIRE)--Apr. 13, 2017-- Mannatech®, Incorporated (NASDAQ: MTEX), a global health and wellness company committed to transforming lives to make a better world, announced the launch of the world’s most complete coffee, GlycoCafe™, infused with the company’s innovative Glyconutrients, making it a healthy choice for coffee lovers. This new product was first revealed to thousands of Mannatech’s independent sales Associates at its recent annual conference, MannaFest℠, where it was well-received and met with enthusiasm from coffee lovers from around the globe, as evidenced by rapidly selling out of all stock on hand. Most coffee drinkers enjoy a morning cup for the benefits of caffeine, which in appropriate amounts may offer alertness and have positive effects on mood. Mannatech’s GlycoCafe, however, includes the whole coffee fruit and is infused with Glyconutrients, which is the core of Mannatech’s clinically tested nutritional technology. Mannatech’s Glyconutrient technology has been clinically proven to positively impact attention in young adults and improve memory and alertness in middle-aged adults*. Much of Mannatech’s nutritional technology is supported by industry-standard clinical studies including 17 human clinical trials that have been published, 12 of which were double-blind, placebo-controlled studies — the gold standard for product validation. Furthermore, GlycoCafe is vegan friendly and free of gluten, soy, dairy, MSG, sweeteners and artificial flavors and colors. In a world where K-Cups® are a popular commodity for quick, single serve coffee, GlycoCafe comes in individual serving slimsticks to easily grab and go, making mornings a breeze. GlycoCafe provides convenience for busy working professionals, students or parents who can now enjoy their coffee from anywhere at any time by simply adding hot water. 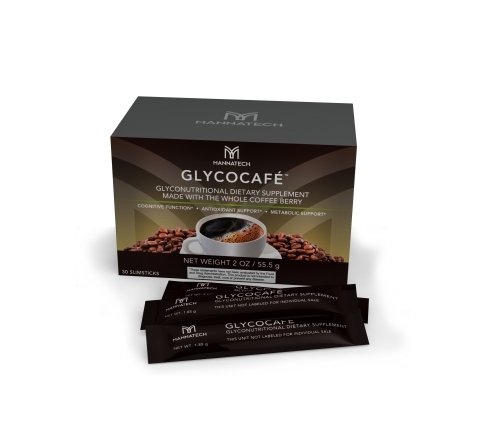 GlycoCafe is now available for purchase through Mannatech’s independent sales Associates in the United States.